This iExpression offers a simple possibility to align a text vertically (top/middle/bottom) also if the text changes over time. This is useful, if you have keyframes on the source text or if you want to replace the text - for example using scripts - and don't want to realign it manually each time. To use the iExpression, you need to specify a maximum number of lines and the expression appends empty lines to the top and bottom of the text until this maximum number of lines is reached. By this, your text has always the same numer of lines and hence the same height, no matter what size the actual content is. Depending on the options you set, the original text is placed in the middle (adding the same number of empty lines to top and bottom), at the top (adding all empty lines at the bottom), or at the bottom (adding all empty lines at the top). The maximum number of lines for the text. 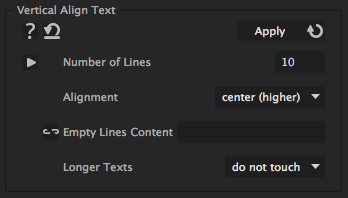 (Or to how many lines the text should be extended with empty lines). Leave empty normally. For testing purposes, but here any letter you like to visualize the empty lines inserted by the iExpression.